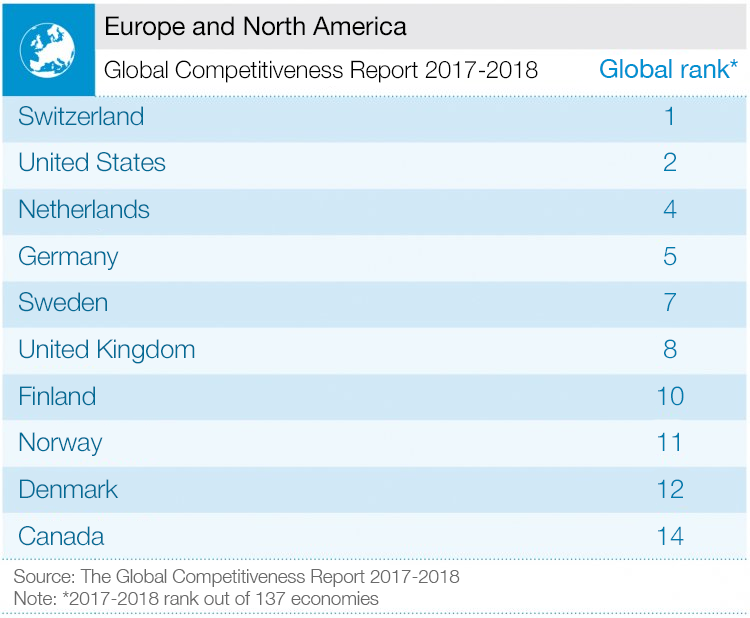 The latest global competitiveness rankings from the World Economic Forum show Canada making only the slimmest of gains in the past year, moving one place forward to 14th – still behind the 13th spot our country earned in 2015/16. It would appear many cycles of government efforts on innovation and productivity have yet to move the dial. One of the main impediments to becoming more competitive is of the government’s own making. Canada’s macroeconomic environment – thanks to an expanding federal deficit – ranked 47th. Our level of government debt was worse ranking 118th. The private sector also bears its share of the blame. Our score on technological readiness, business sophistication and innovation generally placed 23rd. Our use of talent was a bright spot coming in third, as was our score on higher education and training (13th). None of this should surprise Canadian policy-makers. The country’s fiscal position was hammered in 2015 by the sharp drop in oil prices that damaged terms of trade and led to a fall in real incomes. The incoming Liberal government led by Justin Trudeau, along with a new left-of-centre government in Alberta, looked to stimulate the overall economy, and especially resource-heavy regions, with deficit spending. With the economy recovering to lead the G7 in 2017, Ottawa has the opportunity to taper its budget plans or ensure spending is trained on fixing structural impediments to competitiveness. A rise in the higher education ranking from 19th to 13th, for example, will be welcomed as good news, but not good enough. The same goes for our jump from 17th to 9th in the quality of scientific research institutions, an upwards trend which should continue given spending increases announced recently by the federal and provincial governments. Canada has several of the world’s top 500 universities and should be a top 10 player in post-secondary education. A more effective tiering of education focused on education spending outcomes across the board, rather than on a per-student basis, would help – provinces have different policies for dealing with education but tend to spread their spending like peanut butter. One of the problems Canada faces is that too much financial capital is allocated to housing, diverting investment from more innovative fields. Business R&D remains back of the class, despite decades of government incentives and programmes. Although Ottawa is exploring bolder policy ideas, such as a new programme to co-invest with business in “super-clusters”, the challenge in universities and large companies, especially foreign-owned ones, may be more fundamental. Canadian universities are not generating enough commercial IP, while multinational corporations have cut their R&D significantly for years. The overall tax burden remains a shackle on growth and it is tightening. According to the World Economic Forum's Executive Opinion Survey, Canada’s business community considers tax rates to be one of the most significant barriers to doing business. Governments, especially at the federal level, continue to downplay the barriers to domestic investment that they’re building through tax regimes. The survey suggests that Canada's business community views inefficient government bureaucracy as the single most problematic factor in doing business. This is not an area that any major government is currently addressing in an assertive way. Government procurement of technology is missing in action, struggling in 68th position. As governments push business and investors to do more, it might be wise to look in the mirror too and have the government lead by example. 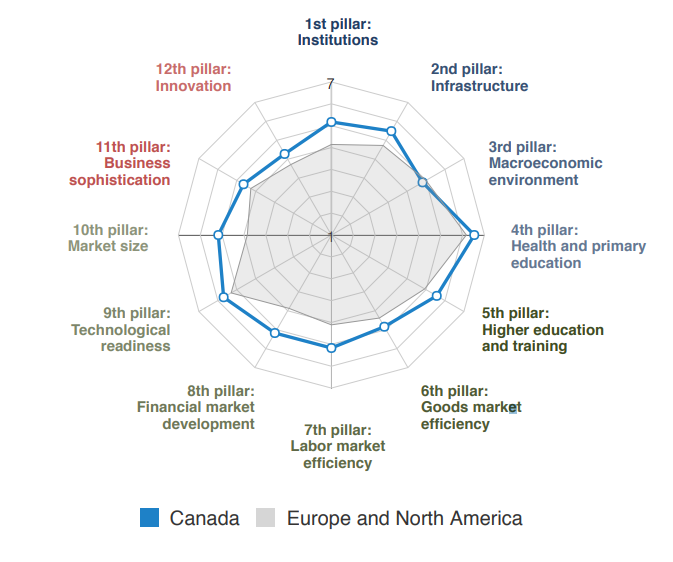 In a 10-year period, it’s easier to see where Canada is making progress. Some of the best gains have been in technological readiness, thanks to the rapid expansion of broadband access and internet use, as well as technology transfers. More curious, for a country that pioneered telephone technology, is our lack of progress in terms of mobile broadband access. One can assume the country’s relatively high costs for mobile usage – the price of an accessible network across such a vast land – are the primary reason. Continued improvements in healthcare and primary education – often cited as the main reasons for those high taxes – are also noteworthy. You can read the full Global Competitiveness Report 2017-18 here.